Both the ruling NDA and the Opposition parties have the concern that how urban and rural India are going to vote in this general election. 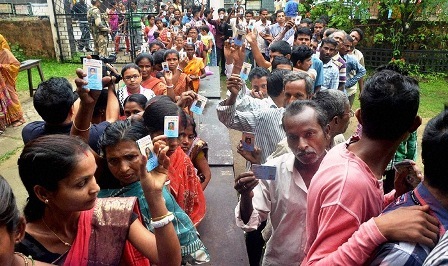 A major question yet to gain momentum in the ongoing LokSabha poll is Urban-Rural divide. India has nearly 450 urban agglomerations with each having about 1,00,000 population. The impact of urban localities on creating opinions is more important as it gets reflected in mass media and spread through casual chats and social media. Therefore, it has to be analysed to evaluate the outcome of the trends and poll results. Though the country possesses vast areas under urban classification it has only about 33 per cent of the total population according to data available. Remaining 67 per cent population live in rural areas. In the age of information, facts bridge the gap of unreachability. In such situation the spread of charchas on politics is easily communicable. Therefore, spread of favourable and unfavourable advocacies on a particular party has become easier. The campaign for the current poll has started long back when PM Modi aggressively started to drive his vehicle of change since the announcement of demonetization on November 8, 2016. Before that, mobocracy was the sole issue for the opposition. At present after the government convincing that the real benefit of notebandhi is increase in number of tax payers and proportionate increase in revenue, that degree of bitterness on De-Mon has seemed to be reduced. It may be evident among urban educated and enlightened. Later Modi tried his concentration on rural India with Ujwala scheme and DBT for farmers along with other Health insurance and women related schemes. As yet we have to know the real impact of such schemes in terms of numbers there are claims that they have made inroads in rural India. However, rural despair among farming community and their co-inhabitants is yet to be fully addressed. The ongoing unemployment debate is mostly surrounding on the failure of agriculture and allied industries. Because, still, they provide large number of jobs to the working population. Also Read : Would Index of Opposition Unity work against NDA? The second major argument against the incumbent is the execution of GST. Though it has settled well now and crossed 1,00,000 crore mark in month but is still to overcome several issues. An allegation is that the one nation one tax regime has killed large number of employment among informal sector. This is especially in manufacturing sector. Precisely the input tax credit system has increased the burden of small scale traders and entrepreneurs, they charge. The counter argument is that for any new system it will take time to settle well among the users/benefactors. GST council, the apex body which runs the system, meets at every month and so far resolved many issues brought forward. Ironically few measures of changes were criticised that went against the very purpose of the system itself! In this background it is interesting to know that whether the current dispensation would gain a second term? As said in the early part it is inconclusive unless the urban India and its opinion makers decide to favour either the incumbent or the opposition. There are several factors that urban India would vote in favour of the incumbent taking the cue from increase of Income Tax limit to Rs 5 lakhs to urban housing, etc. In fact the urban India has appetite for more bold reforms from the Modi government and even may believe that he would deliver that. In contrast the rural India has not significantly gained anything including physical infrastructure and education, health except 100 per cent electrification! Swachh Bharat is said to be a game changer since it has transformed the outlook of rural mindset by softening their ‘socio-cultural difference’ over urban India. But would it fetch votes other than those of women who are said to be largest section of beneficiary of Swachh Bharat? Mann Ki Baat is another outreach for many rural dwellers. Yes. It would be. Because, at earlier times, none of the PMs has come close to them during their tenure. Regional aspiration is another factor that divides the parties across the nation. Regional parties aggrieved that their rights have been abrogated by the centre. Major power contenders of the centre, the BJP and the INC, have entered into different alliances to reach the region. The voice and the integrity are not synchronizing with their political alignments. The issue of state rights is mostly an urban discourse. Though, the rural population which have more voting power have always had followed their state parties in the past. There are many issues like surgical strike which may or may not find a place in voter’s mind while they decide about for whom to vote. Moreover, the seven phase poll is a lengthy process. Moods may persist or may change. But beyond all these things the urban India has influential persons who could twist the trend with their golden touch. On several occasions in the past the rural India has voted surprisingly intelligently than their urban counterpart. Hence it is uncertain to conclusively say in which way the nation would vote. Beyond all everybody has their own Mann Ki Baat!